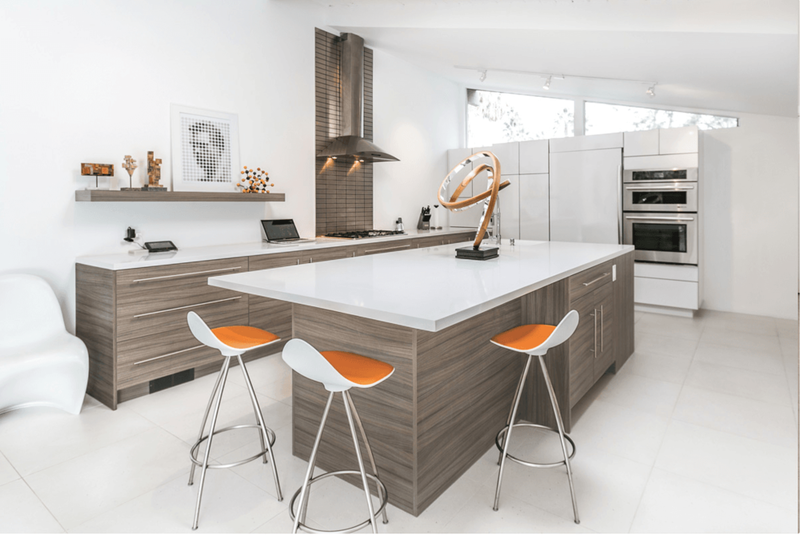 Modern Kitchen Design Trends — Welcome to Project Guru Designs. Porta door in white gloss: also available in super matte. Gone are the days when white gloss cabinets were only for those obsessive types who would baby the fragile surface. Thermoplastic laminates now provide the look- gloss or matte- in a range of colors, as well as worry-free use for today's families. Today's look will contrast this door with textured finishes- wood or textured laminates- to balance and warm minimalist spaces. Block design contrasts white and textured laminate. Coupled with the flat-panel look are flush-set appliances, touch-latch options for cabinetry, floating shelves and maintenance-free quartz countertops surfaces. Add to that architectural lighting, even a flush mounted hood for the ultimate open sight lines. Flush Cirrus hood by Best optimizes sight lines. Gray tones still dominate but color can add great personality: look for brass and golds to return on the metal front, and two tone cabinetry to add interest. Ready to rethink your kitchen? Get in touch! Newer PostPantry Love - It's the Real Thing! Older PostWe Love Kitchen Remodeling - Here's Why!